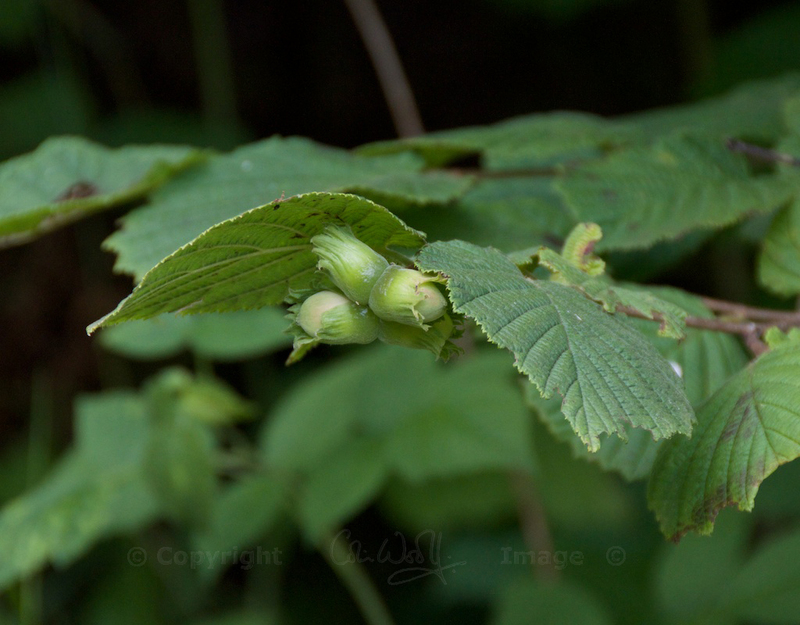 In my series on British trees, I’ve come back to one that’s quite familiar… the hazel. Hazel catkins are coming out in the woods in mid-February, dangling and swaying in the cold wind, but promising warmer days to come. I love looking for them, as they are one of the first signs of spring. Hazel trees (Corylus avellana) have played such an important part in our history and folklore that it’s difficult to know where to begin. 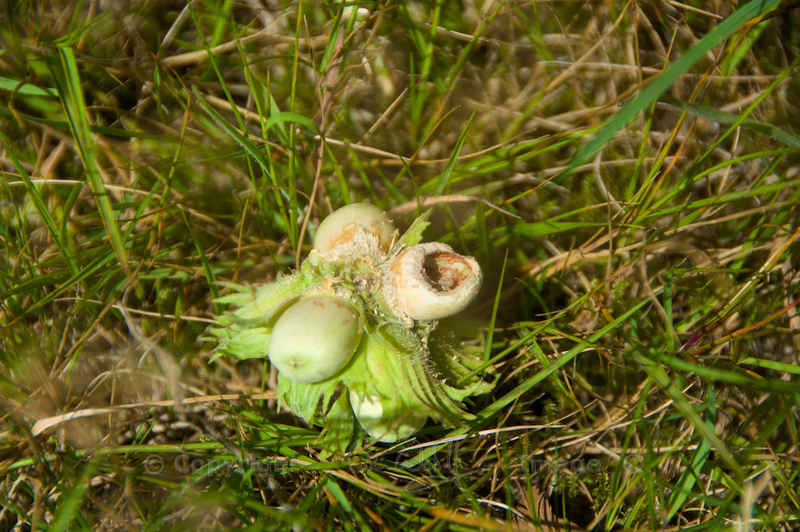 After the last ice age, about 11,000 years ago, they expanded rapidly throughout Britain, becoming one of the first tree species to lay claim to the newly exposed earth. 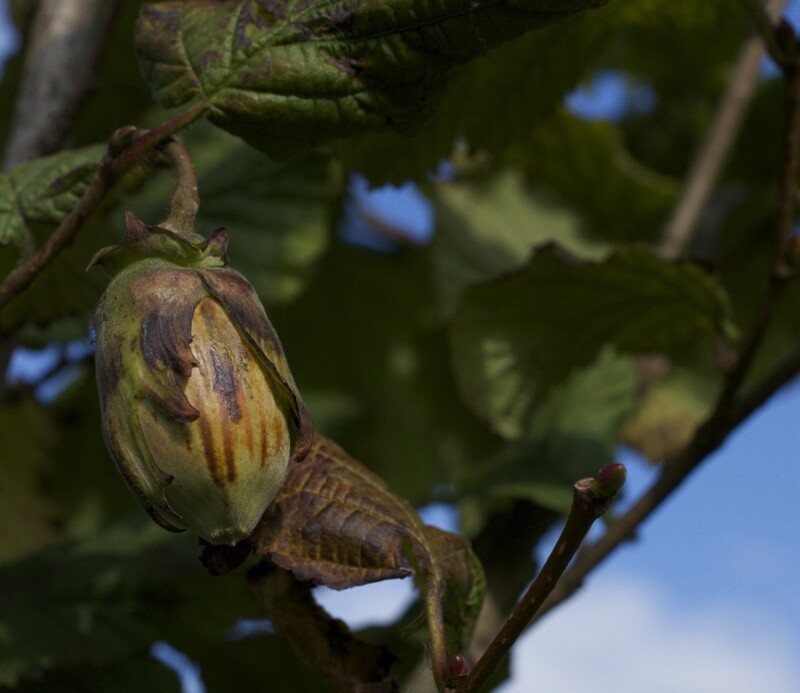 It’s likely that the earliest human settlers took hazel nuts with them as a food source, which would have hastened the progress. 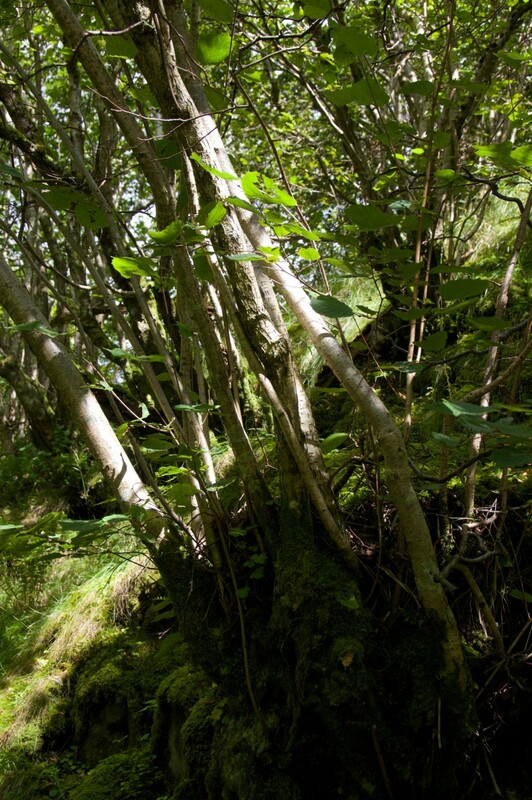 In Scotland, hazel often forms an under-storey of oak and birch woodlands, but it is dotted here and there in stands of its own, such as the ancient Ballachuan hazel wood in Argyll. ‘Tree’ is not really the best word for a hazel, because the species forms a tallish bush, no more than about 20 feet high. 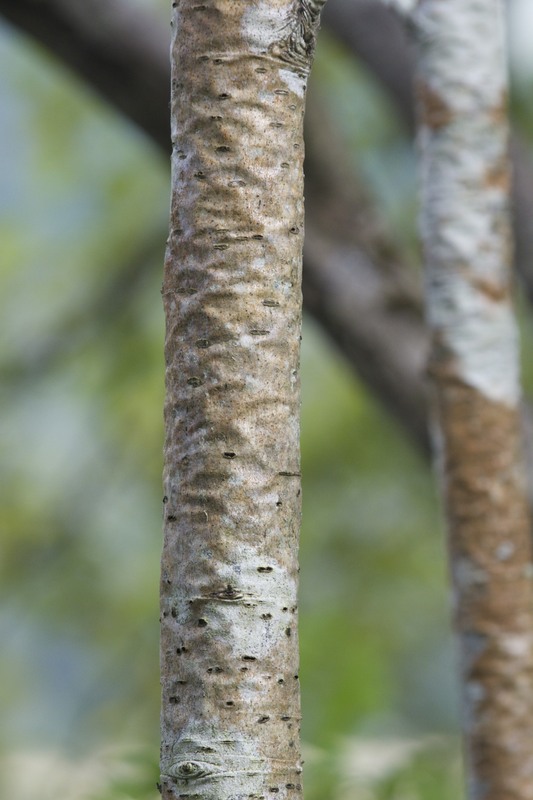 Instead of having just one trunk it produces several slender stems which spring up from the same root – in effect, it is naturally self-coppicing. This is a feature which humans have always found extremely useful. Since ancient times, the pliable branches of hazel have been chosen for weaving and thatching; they strengthened wattle-and-daub walls, and were cut for agricultural fencing. 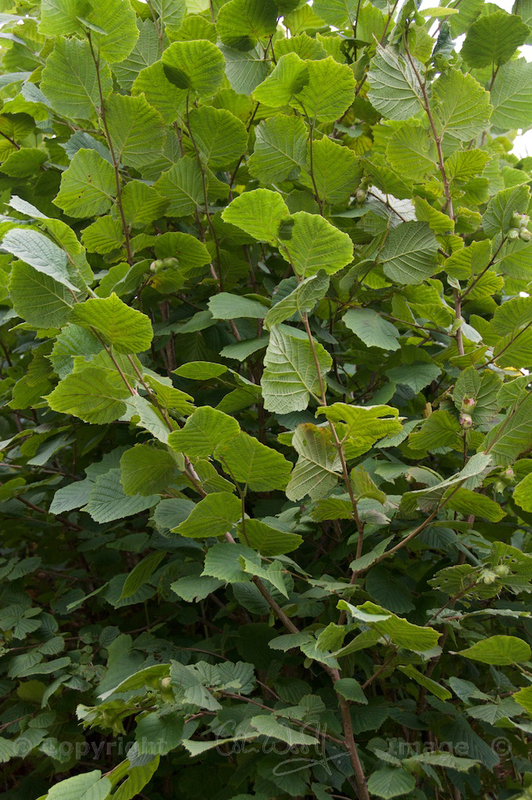 Hazel leaves are finely serrated and rounded in shape, coming to quite a sudden point at the end. They appear after the catkins, and often turn a vivid shade of yellow before dropping in autumn. Both male and female flowers are borne on the same tree. The catkins are the male flowers, and when they are fully open they produce little clouds of pollen that are dispersed by the wind, to settle onto the tiny red female flowers. The fruits ripen into hazel nuts in late autumn. Hazel is a valuable food source for a huge array of wildlife. Red squirrels, wood mice, dormice, jays, woodpeckers and nuthatches feed on the nuts, while the leaves provide food for red deer, roe deer, and the caterpillars of many moths and butterflies. Coppiced hazel offers shelter for ground-nesting birds like nightjars, nightingales, willow warblers and yellowhammers. A whole world of lichens, liverworts and mosses thrive on its greyish-brown bark. In folklore, the hazel tree is associated with the goddess Brighid, who brings divine inspiration. Forked branches of hazel were – and still are – used for dowsing, and an ancient belief in its protective qualities made a hazel staff the accessory of choice for pilgrims, shepherds and other countryside wanderers. Magic wands were fashioned from hazel, and it was once thought that if you wore a crown of hazel twigs and wished very hard, your wish would come true! Known as the Tree of Knowledge in Norse mythology, the hazel was sacred to the god Thor; in Irish and Welsh folklore, the hazel was believed to be a fairy tree, and it still grows near many holy wells. Tara, the seat of ancient Irish kings, was located close to a hazel wood; and it is said that members of the Fianna, a legendary band of Irish warriors, learned to defend themselves with only a hazel stick and a shield. According to an ancient Irish legend, a hazel tree bent its branches over the Well of Wisdom. Nine hazel nuts fell into the pool, and were eaten by salmon, a fish revered by the druids. The fish developed bright spots on their scales according to how many nuts they had eaten. Later, while cooking one of these salmon for his druid master, a young lad called Fionn mac Cumhaill couldn’t resist eating some of the fish himself. In so doing, he absorbed the salmon’s magical knowledge and grew up to become one of the most heroic figures in Irish mythology. The old Irish word for hazel, ‘coll’, crops up in many place names, the most obvious being the island of Coll off the west coast of Scotland. Others have developed from the Scottish Gaelic word ‘calltuin’, which means ‘hazel grove’: Barcaldine in Argyll, and Calton Hill in Edinburgh are just two examples. It is also associated with Clan Colquhoun whose clan badge is the hazel. In the Ogham tree alphabet favoured by poet and historian Robert Graves, the letter C is represented by Coll, the hazel. The old belief that hazel nuts contained so much bite-sized wisdom is the source of the phrase ‘in a nutshell’. 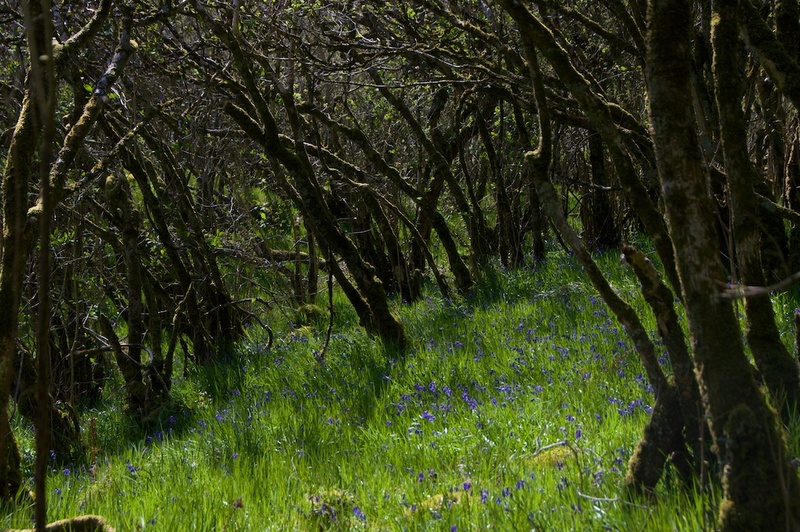 One of the most beautiful woods I’ve ever visited is Ballachuan hazel wood on the island of Seil in Argyll. This is believed to be one of our very oldest woods, dating back as far as 7500 BC. In spring, the woodland floor is a tapestry of bluebells, wood sorrel, primroses, violets and wood anemones, with dappled sunlight streaming through the low canopy and warblers singing in the trees. Holy Cross Day on 14th September was a school holiday up until the First World War, giving school children a chance to gather the nuts. Nutcrack Night was celebrated during November, when the first of the stored nuts were cracked and eaten. Some churchgoers apparently enjoyed them so much that they would take a pocketful to church on the following Sunday, and crack them during the sermon! Hazel is an integral part of the bocage (hedgerows either side of the network of sunken paths which crisscross the Cotentin peninsular. So catkins are everywhere present. The flowers are not quite out yet. Good to know that, Viv! Ours are just about to burst out (the flowers, that is). But we’ve had a frost overnight and someone said something about snow on the way! For me, hazel tree is on of those trees which inspire me quietness and peace. Hazel leaves are lovely too. I have never seen hazel catkins, we don’t have hazel trees near our house so it is something special to see one. Me too, Cornel. I remember one in my grandmother’s garden. I love the catkins of willows, too, small and furry! Really enjoyed this Jo, and what a good year it is for catkins too – they were truly wonderful in the lane this week on our one and only sunny morning. 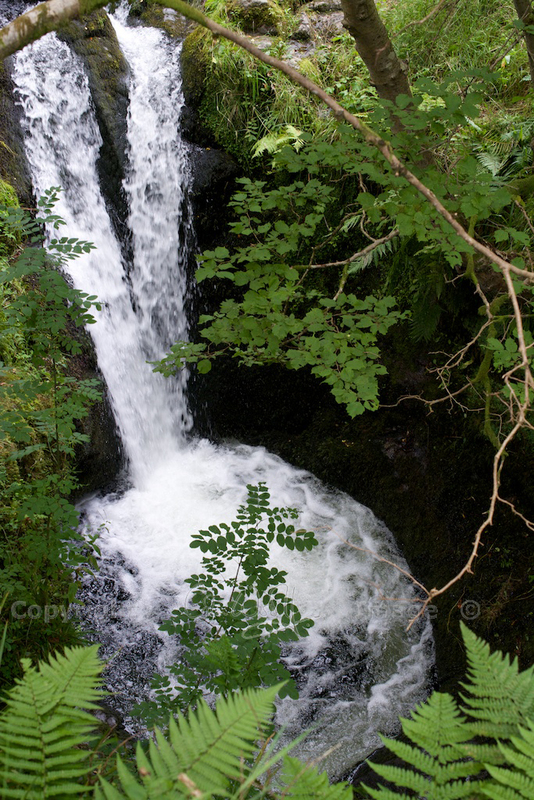 So lovely to read the folklore – fabulous. Thank you, Anny! I meant to say in the article that I came across an old saying “plenty of catkins, plenty of prams” – in other words, lots of babies are born in the years of many catkins! Absolutely fascinating, as always. An outstanding example of knowledge in a nutshell! Great stuff Jo. Wonderful photos. Here’s hoping that spring has indeed sprung! Thanks, David! I hope so, too. I heard a rumour about more snow, though – not sure if it’s true! Thank you Jo for solving a mystery for me! I was wondering what these trees along the nature trail in Glasgow were. I recently wrote a post quoting Katharine Stewart on the topic of hazel’s magical properties (amongst other things) and there is a bit of discussion about dowsing in the comments, if you’re interested: http://christinelaennec.co.uk/2015/02/14/valentines-day-blackbirds-and-the-magical-properties-of-trees/ Thanks again! You’re welcome, Christine, and thank you for that link, which I was interested to read. I am going to have to try dowsing, at some point! I’m so glad I’ve stumbled upon your blog! Great stuff, with a focus that includes my name–what’s not to love? I look forward to reading more! Happy (one of the) Hazel tree day(s), Jo! The 1828 book Circle of the Seasons by Thomas Ignatius M. Forster lists corylus avellana as the plant of the day for 4 January. I found this blog (it’s lovely!) by Ecosia-ing “hazel tree day”. Now I’ve bookmarked it on my bucket list of places to visit! Hi Elen, that’s lovely to know, and thank you! Seems a very fitting plant of the day, when the light is only just beginning to come back and we’re all looking for signs of spring. I’ve been noticing some hazel catkins on the trees already, just waiting to come out when the weather is warmer. I came across your website by chance. 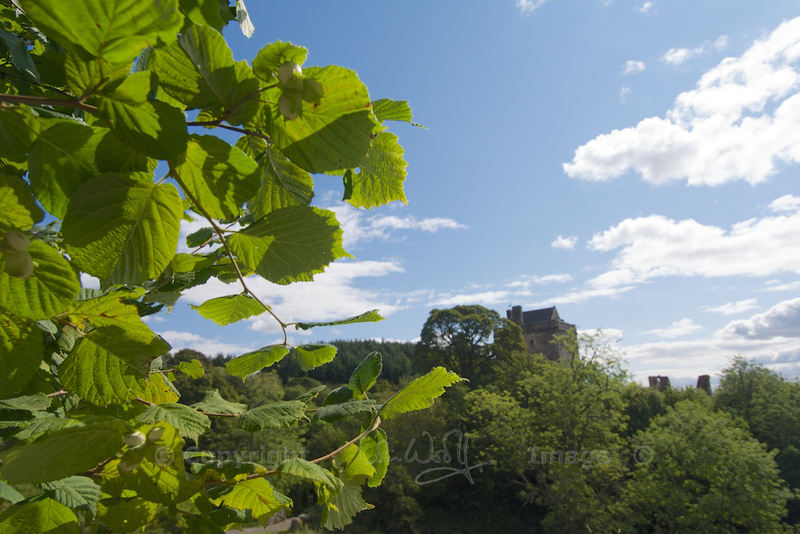 As an artist and plantswoman I’m moved to find such a rich resource of thoughtfully put-together information clearly driven by a passion for trees, the Scottish landscape and more. So inspiring! I will take time to work through all this fine material and will also pass the word onto others. All strength to you Jo and I look forward to the emergence of your new book.